A good sleep is what everyone would like to have. And at the end of a camping day, you will also need to sleep as well to regain your energy. But what if you are having trouble falling to sleep there? In that case, one of the best solutions for this issue is to get a CPAP device. It will help you fall into sleep easier and ensure a quality air supply to your body. Don’t know anything about CPAP? 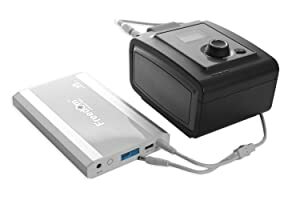 Don’t worry, this article will show you clearly what it is and how to power CPAP machine while camping. CPAP is an acronym for Continuous Positive Airway Pressure. It looks like a box with tubes connects to a mask. Inside the box are a fan, a humid chamber and an air filter. These will convert normal outside airs into sufficient airs for the user. After that, these airs will be transmitted through the tubes to the mask. So CPAP is good at dealing with sleeping problems, especially in an outdoor atmosphere. Naturally, you will need a power source if you wish to bring the CPAP with you while camping. Below are several popular ways, pick one that suits your situation. This is arguably the simplest option of all. You don’t really have to bring anything besides the CPAP itself and cords or adapters in this case. More and more camping sites are equipped with electricity so as to allow a more comfortable experience for campers. All you need to do is to locate an outlet, plug in the CPAP and it’s ready to use. Since the campsite electricity source is generally reliable, the CPAP can have an uninterrupted operation. The downside of this solution is the rather expensive fee. Besides the electricity fee, you also need to set up a reservation beforehand if you want to secure a spot. The outlets of the camp may also not readily compatible with the CPAP so you need to prepare additional adapters. Because of constant noise and smell in such campsites, your sleeping problem can even get worse than before. If you dislike the idea of public campsites, you can use your own car electricity to power the CPAP. You have the freedom to choose whatever place you want to set up the tent in this manner. Since you can use the car as your electric source, you only need to bring the CPAP. When you finally selected a suitable location, deploy the tent and hook the CPAP with the car batteries. If you decide to go to sleep then you just need to start the car. That should power the CPAP as long as the engine is on. Obviously, this means your engine has to be on for the entire night. There is a good chance that the engine may shut down in the middle of your sleep. Even if it didn’t, this will inevitably drain the batteries and the car may end up dead tomorrow morning. While the engine is idling, the car is still going to produce exhaust fume and that may pollute the atmosphere. The generator is a dependable electric source. There are many camping generators on the market that you can easily carry on your trip. They are quite reliable and can power a lot of tools along with the CPAP at the same time. For remote locations, you can hardly figure out how to power CPAP machine while camping beside using a generator. If you want to save the car batteries and a trustworthy electric source, this is the way to go. When the generator is in operation, there will be a lot of noises and fumes. You sleep may be troubled by these factors. That is why public campsites usually forbid the use of generators in their vicinity. While camping generator is not really heavy, it’s still quite cumbersome. There is also the need to prepare fuel to run the generator through the night as well. The operating cost and the generator itself may be a burden to your wallet. If the above proves to be ill – suited to your case, a CPAP battery kit is probably the best option. Available from Amazon to hardware stores, you can purchase or rent such a kit easily. The price of a brand new CPAP battery kit is around 280$. A fully charged kit can power the CPAP for at least 30 hours before you have to recharge it. You just need to make sure that the battery kit is compatible to your CPAP. After that, you can start using it without any problem. While you use the battery kit, you shouldn’t use the CPAP heated humidifier. That function can significantly drain the battery power. In the case that your CPAP doesn’t have DC outlet, you may need to get an inverter. The inverter will also draw additional power from the battery hence reduce it lifetime further. If you want to reduce the drainage, you can store water in the humidifier without turning it on. This will turn it into a passive humidifier and that is still good enough. If you are really good at improvising, you can make a battery kit on your own. Buy a set of deep cycle marine battery, suitable DC cables and adapter with agitator clips. Connect the battery through the DC cable to your CPAP and there you have it, a solution of your design. Camping is a fun and exciting outdoor activity. But as with any others, at the end of the day, you still need to go to sleep. Having a good sleep will re-energize you for the next day. And nothing can ensure that better than a CPAP. But to properly support the CPAP in the middle of a camping trip is no easy task. Lucky for you though, you can learn how to power CPAP machine while camping right now. After you have read through the above options, you can consider them and select the best choice for yourself. Thank for sharing us very nice tips. I believe it will be helpful for my next camping tips.